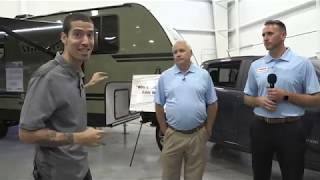 You're going to love camping in this well designed unit! 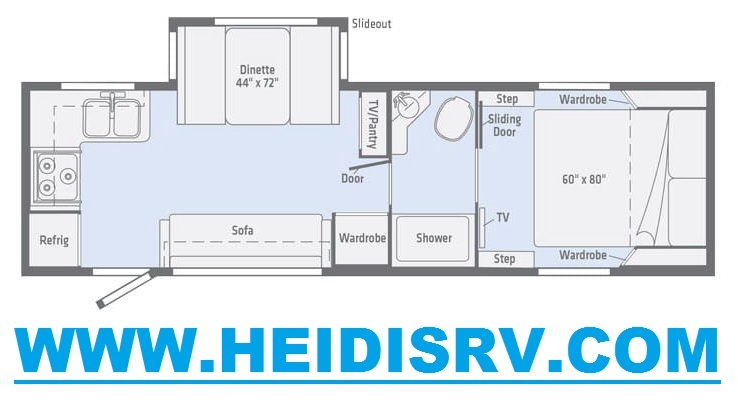 This fifth wheel features a walk-through bathroom with a tub/shower, a toilet, a vanity sink, and a linen closet, plus there is an entrance into the bedroom. Inside the front private bedroom, there is a queen bed with wardrobes on either side and a LED TV for those nights when you just can't fall asleep. The hardest decision you will have to make is whether to cook indoors or outdoors at the pull-out kitchen. Then you can comfortably enjoy your breakfast at the booth dinette. 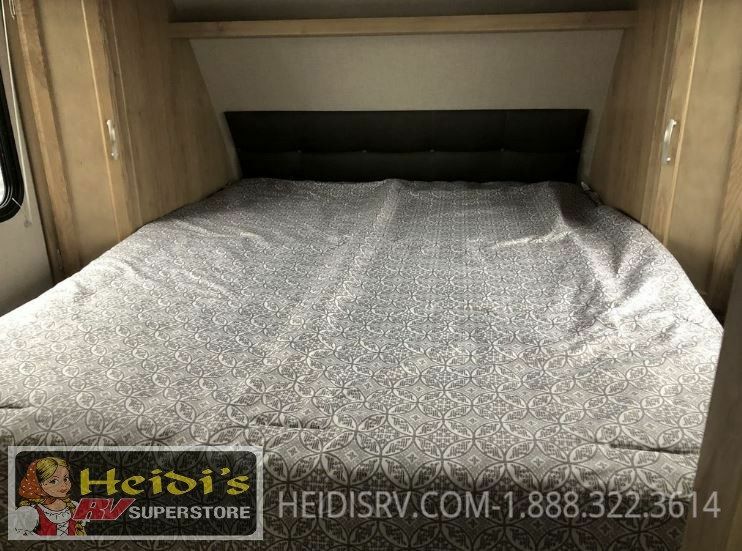 Your kiddos will also love having their own set of rear bunk beds! You won't be able to pass up this bath and a half unit for your next family getaway! 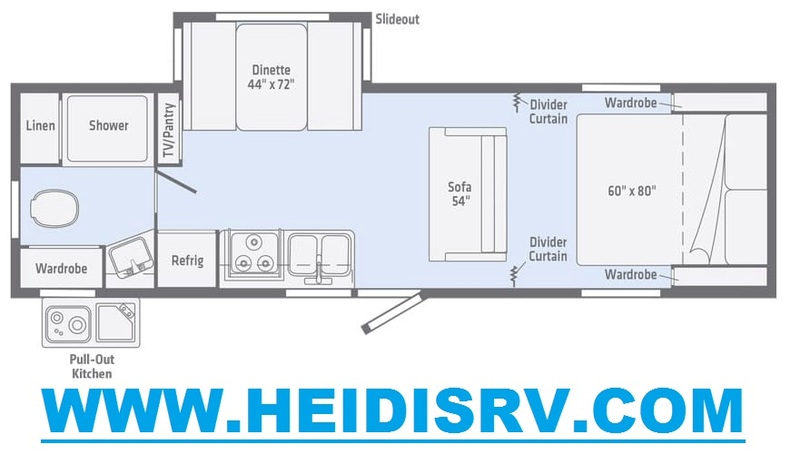 Your kiddos will love having their own set of rear bunk beds with a tub/shower and a toilet located right next to them. 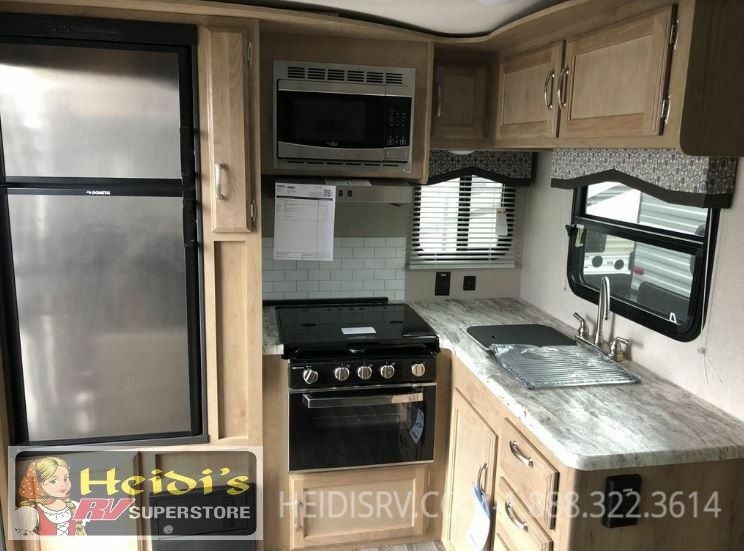 As you head into the living/dining area, you will find a flush mount three burner range with an oven for you to easily whip up some delicious meals, and the double sink makes clean up fast and easy. 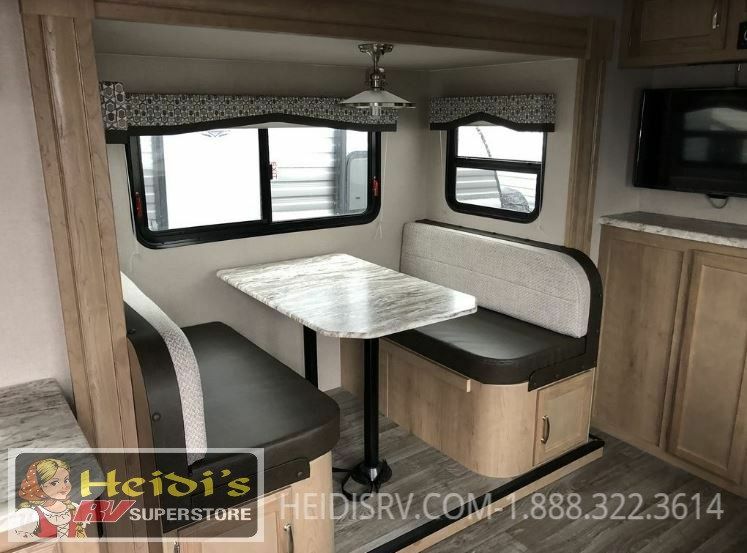 The large booth dinette is the perfect place for you to enjoy your meals and at night you can transform it into an extra sleeping space. As you head towards the front bedroom, there is a private toilet with a sink across the way. You will enjoy a good night's rest on the front queen bed with wardrobes on either side! Head out in style with this roomy couples unit. The rear large bathroom gives you plenty of space to get ready for the day, and even has a linen closet for easy storage. You can whip up some delicous breakfast in the galley kitchen and enjoy it at the large dinette. Or, entice all your neighbors over while cooking something tasty on the outdoor pull-out kitchen. In the evening, getting ready for bed is easy with the semi-private bedroom with 2 wardrobes beside the comfortable bed. This unit also has the luxuries you need including USB ports so you can keep your electronics charged up, LED TV and outside speakers. This cozy unit features a walk-through bath for your convenience! 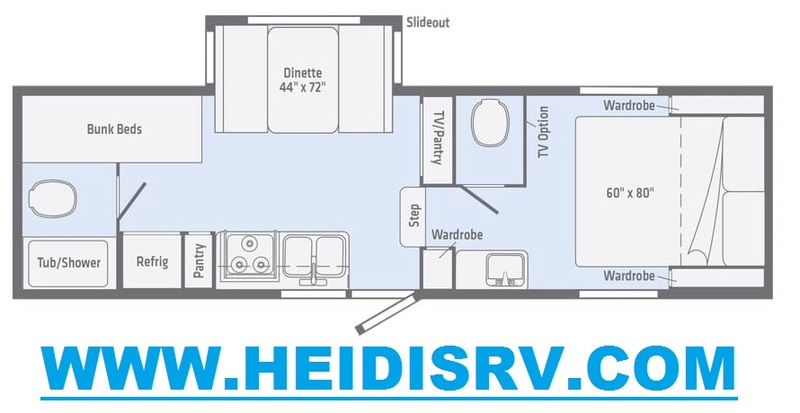 It has a tub/shower, a toilet, and an angled sink with extra counter space, plus there is a wardrobe located just outside of the bath right next to the sofa. 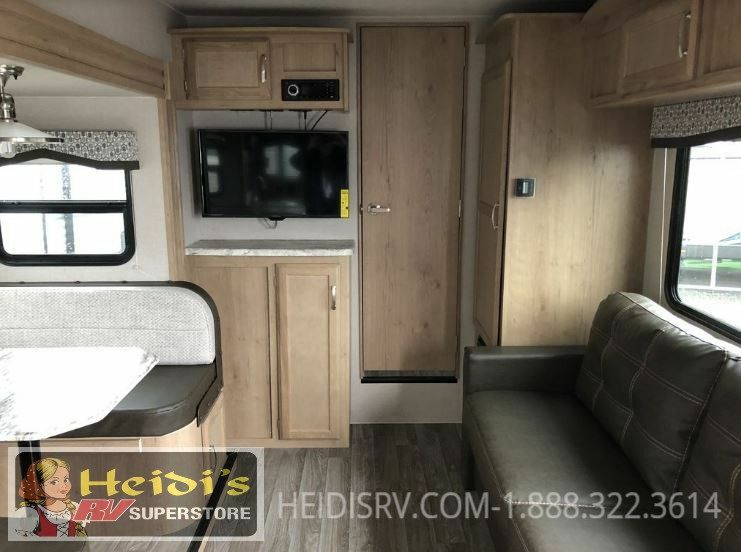 Across from the sofa is a booth dinette for you to enjoy your meals at and a LED TV/pantry for your entertainment and snacks all in one place. The rear kitchen has a flush mount three burner range with an oven, overhead cabinets, and a double sink so cleanup is a breeze, plus extra counter space for an easier prep area! 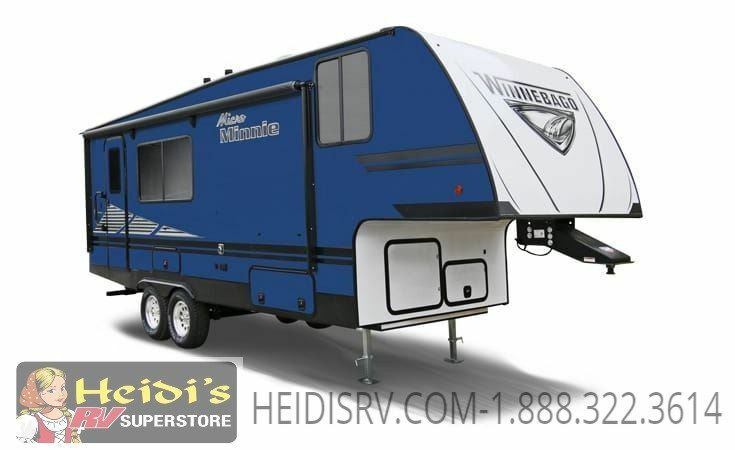 This spacious and stylish unit has you covered for wherever your adventurous spirit takes you! The private bedroom with walk around Queen bed and 2 wardrobes opens into the walk-through bathroom with all the amenities you need including toilet, shower and angled sink to give you lots of space. After a busy day outdoors, unwind in the theatre seating with a glass of wine and watch your favorite movie on the LED TV. 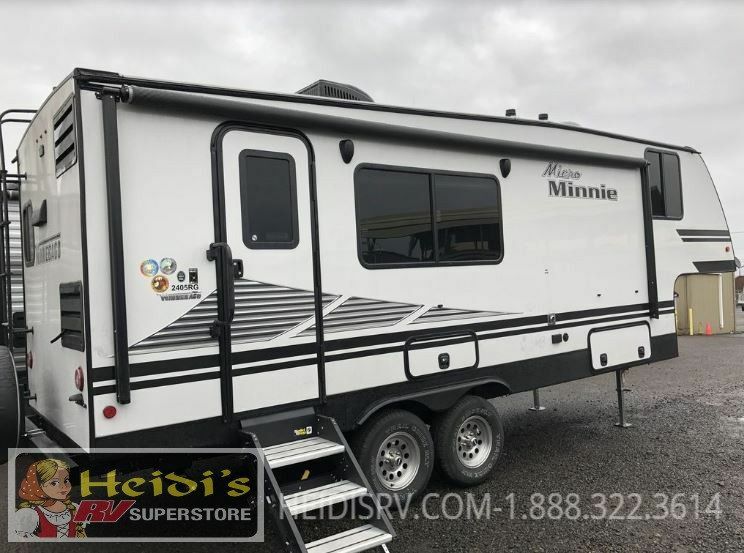 Or enjoy an evening playing games at the dinette that slides out for plenty of space while you listen to your music on the Bluetooth stereo system.